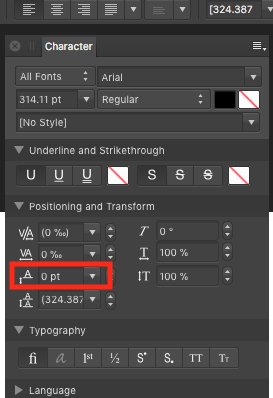 Please could you select the Artistic Text Tool then click the Character button from the context tool bar this should bring up the window shown in my attached screenshot Then could you please check the section I have highlighted in red is set to zero? Hi, thanks! That was the problem! Though I do have some weird things happening in the frame text boxes too. Even after fixing this, sometimes my spacing between lines is super small and I can't change it unless I change the paragraph spacing. I'm not hitting enter to cause the text to move to the next line and trigger a paragraph so I'm not sure why it's happening either. Seems like my settings got all crazy recently.